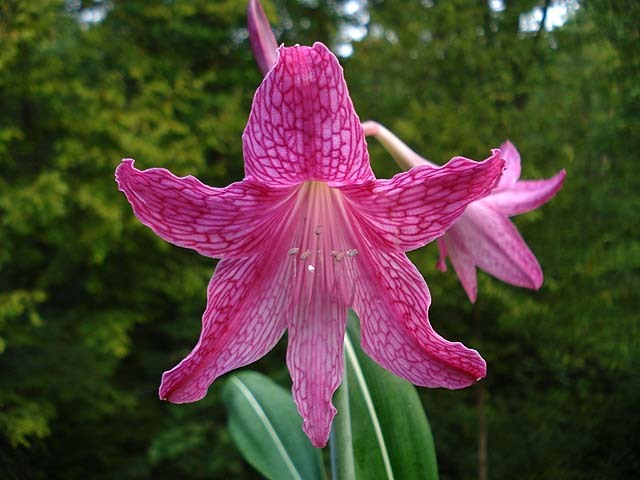 Hippeastrum reticulatum within the subgenus Sealyana was discovered in 1820. 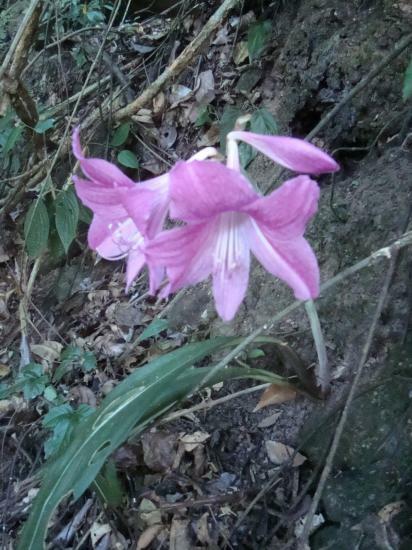 It grows in wet organic sandy soils in Southern Brazil (500-2500 ft) and usually needs a 4-6 weeks dormancy during winter and blooms in the fall. 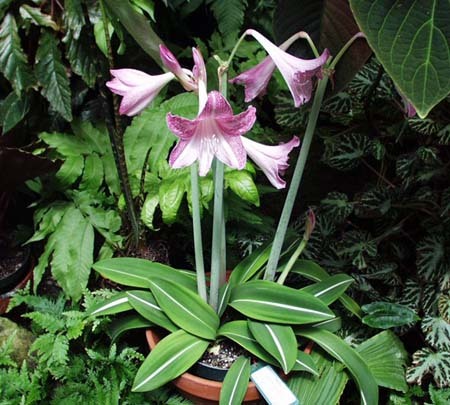 It was one of the earliest hippeastrums to be discovered and brought into cultivation in Europe and was introduced by Edward Whitaker Gray in 1777 and first described as Amaryllis reticulata in 1788. 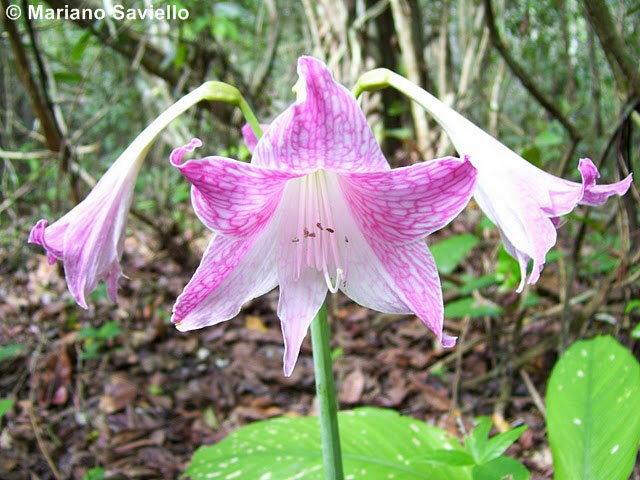 The tepals were described as "petalis transverse venosis distincta", a reference to the defining feature of this species with an unusual and exquisite reticulated veining of the flower in a color of darker than the generally pink or purplish pink background of the tepals. This species is self-fertile. This mode of reproduction, although it does not guarantee a high genetic diversity in natural populations, allows the multiplication through seed while in isolation, so it is a strategy used by many colonizer species. 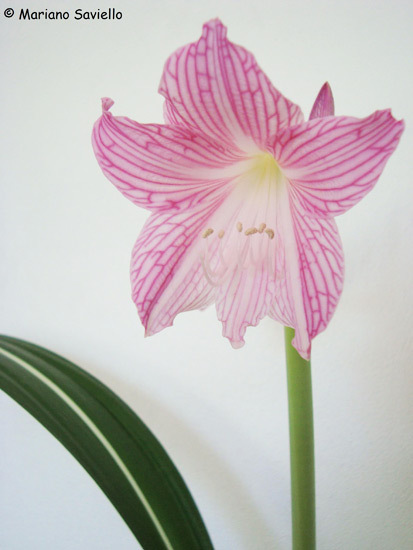 However, H. reticulatum is an exception, since most of the species of Hippeastrum are generally self-infertile and cross-pollinated. Furthermore, they have several strategies to prevent self-pollination and encourage allogamy (outcross). Thus, there are self-incompatible species, which can only produce seeds if they receive pollen from individuals that are not genetically related. Generally the pollen is released about two days before the stigma is receptive, which also tends to ensure cross-pollination. 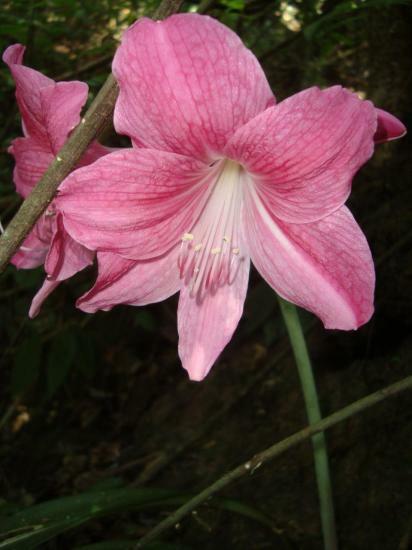 This species and its varieties differ from other Hippeastrum in having round, turgid, fleshy seeds, which are rich in lipids and usually orange-red, and not black and papery. Both var. reticulatum and var. striatifolium grow mixed together, indicating that the varietal characteristics are caused by one or a few genes (the white leaf stripe carries over to F1 hybrids). The plants grow in sandy soil underneath a vegetation type known as Forest Mussununga. The trees in this forest have smaller diameters with the canopy rarely exceeding 15-20 m which allow ample light to reach the floor. These forests occur all along the coast, mainly on the flat parts of the Coastal Plains and part of the coastal strip and extend to the interior in elongated shapes, which can reach more than 13km continuously. The sandy soils have poorly developed structures, low capacity to retain moisture and nutrients, and suffer during the rainy season due to strong influence of groundwater. The organic layer present in these subsurface soils often acts as a barrier hindering both the root development and the passage of water. It is a fragile ecosystem that is easy degraded and has a difficult recovery from disturbance. 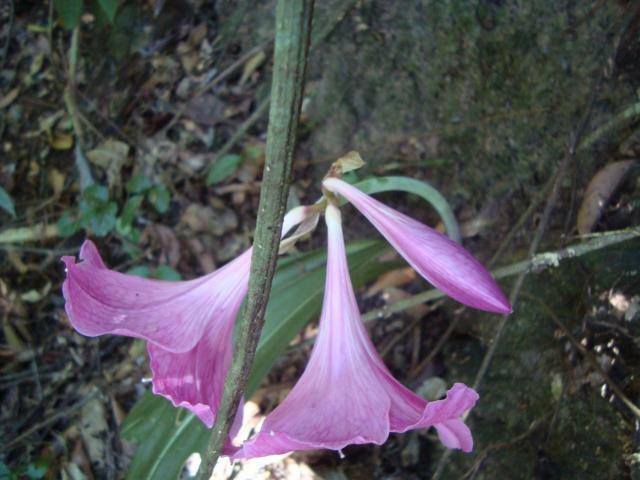 These forests are abundant in bromeliads (25 species), orchids (100 species), and Araceae (21 species). Among the most common species in tree layer, include: Guapira opposita (João-mole), Kielmeyera albopunctata (Nagib), Andira nitida (Angelim-de-morcego), Manilkara subsericea (dyke), M. subsericea (Sapatão), Simira eliezeriana (Maiate), Aspidosperma pyricollum (Pequiá-sobre), Eugenia sulcata (Araçatuba), Gomidesia martiana (Batinga-da-mussununga), E. bimarginata (Batinga-cabocla), Ocotea neesiana (Canela-da-mussununga) and O. notata (Zico). 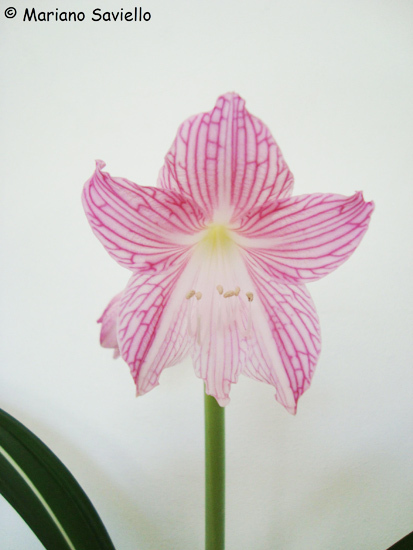 Hippeastrum reticulatum var. reticulatum is native to Brazil. The first two photos below were taken in the wild by Mariano Saviello. 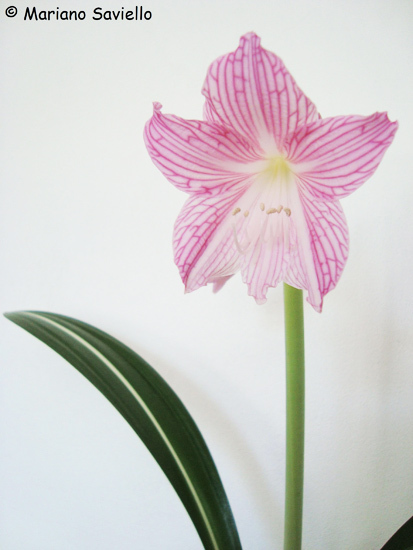 Hippeastrum reticulatum var. striatifolium is native to southern Brazil (Linhares, Espíritu Santo). 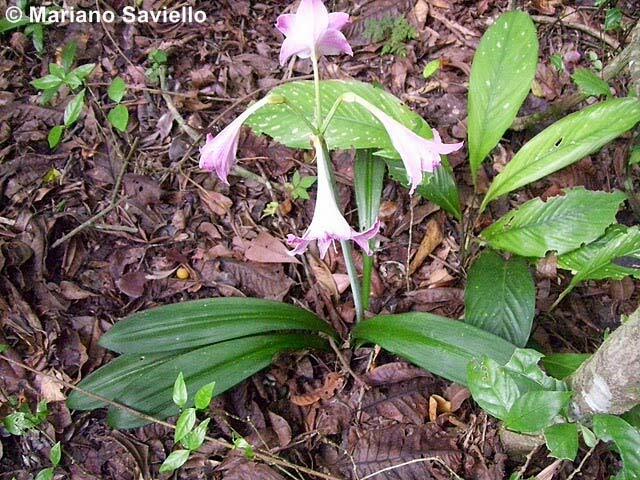 It is also sold in the province of Misiones (Argentina) as an orchid. There is a single longitudinal pure white stripe running the full length of the mid-rib. The veining in the flowers was described as less pronounced than in the type form. 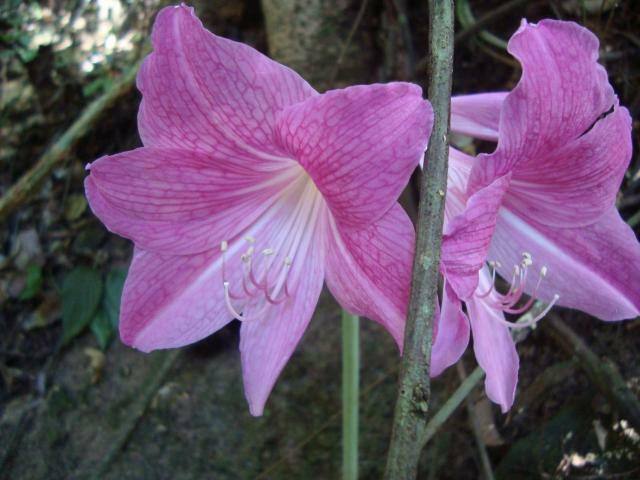 The flowers can be pale pink with deep veining to a richer pink combined with a dark magenta reticulation, to an almost purple-pink shade with very dark veins. 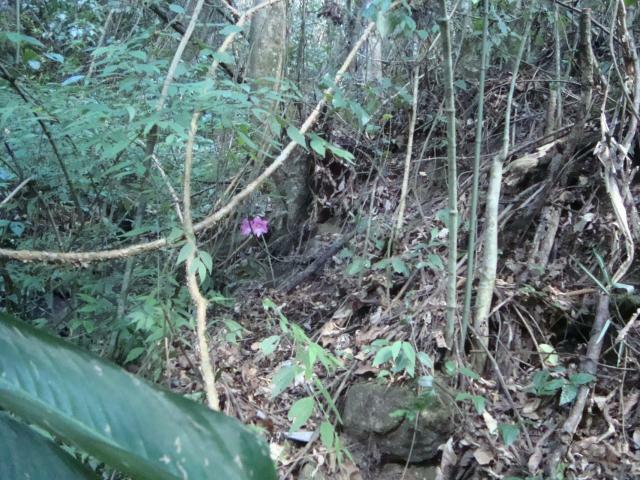 There is a small-sized clone in Cairns Botanic Gardens (Queensland, Australia) of the darker flowers with unusual purple flecks and streaks on the underside of the leaf. The red color of the inner walls of the capsule when it opens is suggested as an attractant to dispersal agents like birds. 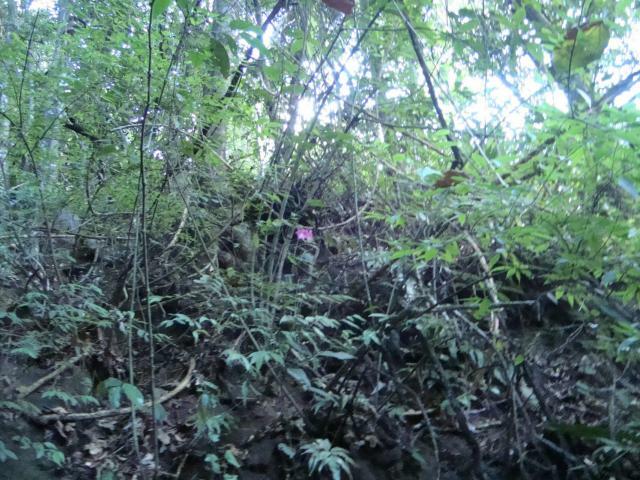 The in situ photos below were taken by Lucas Garcia in February in deciduous forest in Minas Gerais, Brazil. It can be found in sandy soils, rich in organic matter. Photo 1 courtesy of Alan Meerow illustrates this variety. Photo 2 was taken by Jay Yourch in August 2007. Photos 3-6 were taken by Mariano Saviello of plants growing in his greenhouse. 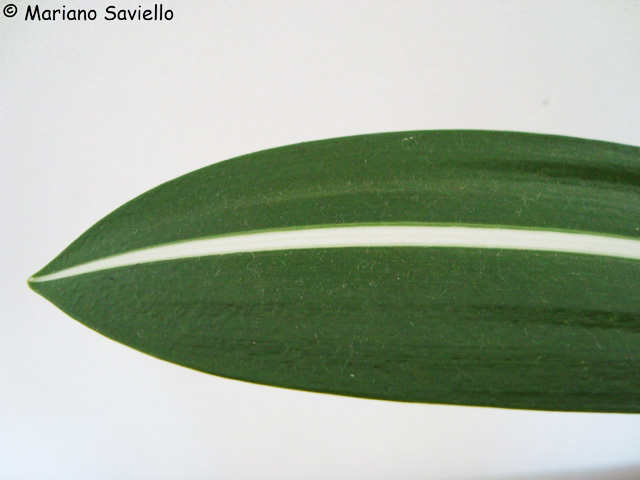 The last photo shows the single white stripe down the leaf that is characteristic of this variety. There are a few hybrids in circulation that mask as real species. However, hybrids such as 'Mrs. Gardfield', 'Silhouette' ,'Bangkok Rose', etc., have leaves that are marked by a yellowish-white median strip(s) (never pure white in F1 hybrids), are shorter, and more blunt with more rounded apex leaves that grow horizontally prostrate, parallel to the ground. 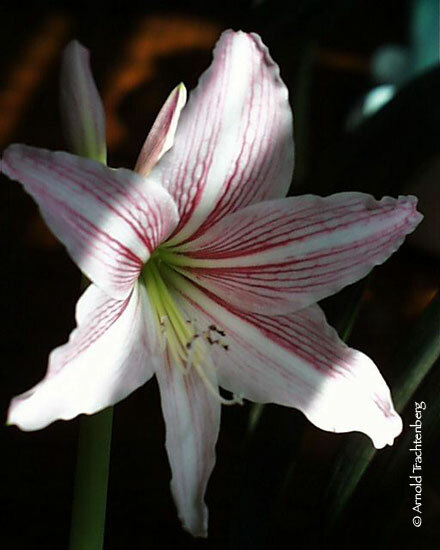 The photo below from Arnold Trachtenberg is probably a hybrid and looks a lot like hybrids of this species often do.